This month we have seen a plethora or articles in UK newspapers calling for an end to prohibition. There have been so many we thought we’d bring you the best of them in one blog. The articles are written by a variety of people including a former chief constable, a well-known British philosopher and the former President of Brazil not to mention a number of journalists. This increase in the number of articles in the British press reflects a change that is going on globally. As a number of Latin American countries move towards decriminalisation, it is sad that the UK government is so far behind in its thinking. First up was Simon Jenkins in the Guardian who argued that the War on Drugs was ‘moral idiocy’ and praised the Latin American governments for their courage in admitting that current policy has failed. ‘The underlying concept of the war on drugs, initiated by Richard Nixon in the 1970s, is that demand can be curbed by eliminating supply. It has been enunciated by every US president and every British prime minister. Tony Blair thought that by occupying Afghanistan he could rid the streets of Britain of heroin. He told Clare Short to do it. Gordon Brown believes it to this day. Days later in The Observer, Fernando Henrique Cardoso, former President of Brazil, summarised the report he and the former presidents of Colombia and Mexico co-authored. ‘A decade or so ago, it could be argued that the evidence was not yet in on drugs. No one has ever believed illegal drug use could be eliminated, but there was a defensible view that prohibition could prevent more harm than it caused. Drug use is not a private act without consequences for others; even when legal, it incurs medical and other costs to society. A society that adopted an attitude of laissez-faire towards the drug habits of its citizens could find itself with higher numbers of users. There could be a risk of social abandonment, with those in poor communities being left to their fates. Just days later, the Executive Director of the UNODC wrote an article in the Observer disputing these arguments. He initially focussed on the claim made by John Gray and many others including Transform, that the costs of prohibition outweigh the benefits. ‘Maybe western governments could absorb the health costs of increased drug use [that he assumes would occur once drugs were legalized], if that's how taxpayers want their money to be spent. ‘But what about the developing world? Why unleash an epidemic of addiction in parts of the world that already face misery, and do not have the health and social systems to cope with a drug tsunami? A few months ago we had a comment posted on the Transform blog refuting this argument. ‘Was it just me or did someone else pick up the massive contradiction underlying the WDR's main argument for continued prohibition? In section 2.1 of the report, the UNODC crowd pretty much concedes that a legalize-tax-and-regulate framework would work...but only in developed countries. Developing countries are thought unable to impose meaningful taxes and regulations on a legal drug industry, and therefore, would see their consumption levels explode. Thus, global prohibition must continue for the sake of poor countries (the condescension is almost unbearable). On the same day, and in the same newspaper, that Costa, wrote his piece, Tom Lloyd, a former chief constable, argued that the War on Drugs was a ‘not only very expensive and misdirected activity, but counterproductive and harmful’. ‘More recently, I have been working abroad and the problems that exist worldwide are recognised at the highest levels, with most acknowledging the harmful unintended consequences [including Costa himself] of the current approach. A huge criminal market (with enormous financial incentives) has been created using corruption and violence to make its huge profits. ‘Efforts to destroy crops only destroy peasant farmers' livelihoods and the environment, while the poppy fields and coca plants spring up elsewhere, with producers adapting to meet the demand. Growing other crops is futile if the demand for drugs remains. In the same edition of The Observer there was a leader article calling for ‘a new drugs policy’ and arguing for an honest evaluation of the current drugs laws. This has been Transform’s position from the start. Now is the time to assess the impacts of the current policy and look to a future where drug use is not a moral issue but a public health issue where drugs are controlled and regulated by governments not gangsters. Transform yesterday wholeheartedly welcomed the results of the heroin prescribing trials (as reported by the BBC), and the understanding that these pilots would be rolled out further still – perhaps to four or five new locations. However, as the RIOTT Trials are published to much celebration, what have we really discovered? That should not be news to anyone. I realised during my third or fourth interview yesterday, that the feigned shock from radio presenters that the Great British Public would be funding heroin users ‘addiction’, should be as nothing compared to their real shock that we are all funding the prohibition that leads users to steal and compromises their health in the first place. Whilst the presumed roll out is to be welcomed, one has to ask why it has taken so long to come to this conclusion. Evidence has existed for years that, for those assessed as having a clinical need, heroin prescribing will keep them alive, improve their health and wellbeing and reduce the collateral damage of their use to wider society. Indeed there has been a barely concealed sense of inevitability about these trials; the strong impression being that they were needed to provide political cover for a roll out, rather than to provide yet more evidence of the blatantly obvious. Of course supervised use of legally regulated supplies of heroin significantly improve the lives of users, who otherwise have commit crime to raise money to score dirty drugs from gangsters, for consumption using dirty paraphernalia in marginalised and unsafe environments. The lesson here is that moves to take users out of the illegal market and into a regulated supply where drugs are quality controlled will produce the kind of outcomes we all want to see. The fact is that thousands of long term dependent heroin users have died, or contracted serious diseases in the last three decades because of the failure of Government to maintain or develop heroin prescribing services. And, with the Department of Health playing badly strung second fiddle to the Home Office, much of the medical establishment has been complicit in this tragedy by maintaining a deafening silence. But NHS heroin isn't the only way forward here; access to cheap smokeable opium from licenced outlets would also achieve significant decreases in crime and improvements in health, as it would also promote transition towards safer products, using behaviours, and using environments. We would hope too, that the next round of trials includes provision of oral morphine (and possibly other pill form synthetic and semi-synthetic opiates), which will be effective for many, and is also dramatically cheaper, and safer, than injectable dry ampules. The substantially increased cost of prescribing injectable heroin, compared with oral methadone, must also be seen in the context of the Macfarlane Smith monopoly on the UK opiates market that the Department of Health buys from. That means that the UK pays well over the odds for our diamorphine (£12,000 a year per user), compared to the Dutch (£2000 a year for the same product). This artificial cost barrier has been a major political obstacle. Finally, let us hope that these trials pave the way to more discussion of how best to control and regulate drug supply and use, beyond the limited numbers able to avail themselves of medicalised heroin. And that those members of the medical establishment who have held this initiative back, feel their consciences pricked and support a scheme that could save the lives of hundreds more in the future. 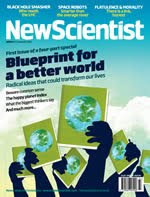 This weeks' edition of New Scientist magazine has a cover feature titled 'Blueprint for a better world' that considers 10 'radical ideas for transforming society and changing the way countries are run'. One of them is the legalisation and regulation of drugs, copied below. Whilst we didn't initiate or suggest the piece, we have contributed. We live in an imperfect world. Poverty, disease, lack of education, environmental destruction - the problems are all too obvious. Many people don't have clean water, let alone enough food, and the unsustainable lifestyle of the wealthy few is storing up catastrophic climate change. Can we do anything about it? You bet we can. Technology is a double-edged sword, but science and reason have made our lives immeasurably better overall - and only through science and reason can we hope to make a real difference in the future. So here and over the next three weeks, New Scientist will explore diverse ideas for making the world a better place, and the evidence backing them. The argument most often deployed in support of the status quo is that keeping drugs illegal curbs drug use among the law-abiding majority, thereby reducing harm overall. But a closer look reveals that this really doesn't stand up. In the UK, as in many countries, the real clampdown on drugs started in the late 1960s, yet government statistics show that the number of heroin or cocaine addicts seen by the health service has grown ever since - from around 1000 people per year then, to 100,000 today. It is a pattern that has been repeated the world over. A second approach to the question is to look at whether fewer people use drugs in countries with stricter drug laws. In 2008, the World Health Organization looked at 17 countries and found no such correlation. The US, despite its punitive drug policies, has one of the highest levels of drug use in the world (PLoS Medicine, vol 5, p e141). A third strand of evidence comes from what happens when a country softens its drug laws, as Portugal did in 2001. While dealing remains illegal in Portugal, personal use of all drugs has been decriminalised. The result? Drug use has stayed roughly constant, but ill health and deaths from drug taking have fallen. "Judged by virtually every metric, the Portuguese decriminalisation framework has been a resounding success," states a recent report by the Cato Institute, a libertarian think tank based in Washington DC. By any measure, making drugs illegal fails to achieve one of its primary objectives. But it is the unintended consequences of prohibition that make the most compelling case against it. Prohibition fuels crime in many ways: without state aid, addicts may be forced to fund their habit through robbery, for instance, while youngsters can be drawn into the drugs trade as a way to earn money and status. In countries such as Colombia and Mexico, the profits from illegal drugs have spawned armed criminal organisations whose resources rival those of the state. Murder, kidnapping and corruption are rife. Making drugs illegal also makes them more dangerous. The lack of access to clean needles for drug users who inject is a major factor in the spread of lethal viruses such as HIV and hepatitis C.
So what's the alternative? There are several models for the legal provision of recreational drugs. They include prescription by doctors, consumption at licensed premises or even sale on a similar basis to alcohol and tobacco, with health warnings and age limits. If this prospect appals you, consider the fact that in the US today, many teenagers say they find it easier to buy cannabis than beer. Taking any drug - including alcohol and nicotine - does have health risks, but a legal market would at least ensure that the substances people ingest or inject are available unadulterated and at known dosages. Much of the estimated $300 billion earned from illegal drugs worldwide, which now funds crime, corruption and environmental destruction, could support legitimate jobs. And instead of spending tens of billions enforcing prohibition, governments would gain income from taxes that could be spent on medical treatment for the small proportion of users who become addicted or whose health is otherwise harmed. Unfortunately, the idea that banning drugs is the best way to protect vulnerable people - especially children - has acquired a strong emotional grip, one that politicians are happy to exploit. For many decades, laws and public policy have flown in the face of the evidence. Far from protecting us, this approach has made the world a much more dangerous place than it need be. 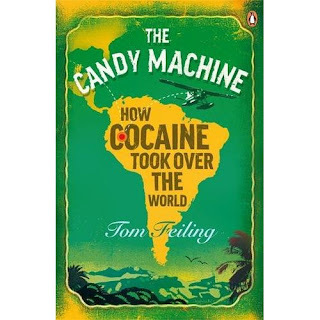 We'd like to recommend The Candy Machine: How Cocaine Took Over the World by Tom Feiling as our book of the month. The author of this book makes plain in his introduction that he was less interested in the opinions of experts and celebrities than he was in hearing the viewpoint of the ordinary people involved in the cocaine trade, from peasant coca farmers through to urban crack smokers, in the interests of presenting as authentic a picture as possible of the impact of cocaine on society. The book is divided into three sections. The first charts the history of the cocaine trade from the conquistadors to the present, as well as the increasing levels of repression the US government has employed against it. The second analyses the cocaine trade's impact on those countries that produce it or through which it is trafficked, focussing on Jamaica, Mexico, and of course Colombia, asking why that country is the only one in the world to be a producer of cocaine, cannabis and heroin (apparently a combination of proximity to trade routes, a long tradition of lawlessness, economic inequality and chronic underinvestment in the rural economy). In all cases Feiling attempts to show how the economic circumstances of these producer/transit countries makes the cocaine trade so powerful that law enforcement efforts are doomed never to be able to do more than inconvenience it, let alone eradicate it. Indeed, the level to which Colombia's government, police and judiciary are complicit with the cocaine traffickers is truly spectacular. A salutary warning of the likely consequences of continuation of current policies is the incipient transformation into narco-states that afflicts those countries in West Africa which have become transit hubs for cocaine entering Europe; Feiling notes that the cocaine trade offers prospects for economic development that international neo-liberal financial policies have failed to provide for these states with weak government and scant resources, and is therefore unlikely to be effectively opposed by the local population. The third section concerns prospects for the future. There is detailed analysis of the demand for cocaine and why it is so persistent, as well as the health consequences for different forms of the drug, which concludes that problematic use, especially of crack, is usually a symptom of underlying emotional problems, sometimes but not exclusively associated with poverty and deprivation, noting that the 'career' of the average cocaine user is far shorter than that of typical heroin or alcohol users. In the chapter analysing the arguments for legalisation and where they are coming from, we hear from Jack Cole of the group Law Enforcement Against Prohibition, and Sir Keith Morris [now a Transform supporter], whose experience as the UK's ambassador to Colombia has led him to come out against the war on drugs - both indicative of the fact that even those charged with defending prohibition can draw their own conclusions when exposed to the consequences. Discussion of cocaine rarely makes much mention of coca leaf tea/chewing, but here we are told of the Colombian coca-leaf drink producers who had to fight a lawsuit to be allowed to use the word 'coca' in the name of their product, and of the WHO report (it was suppressed by the USA who threatened to withdraw funding) that found that chewing coca leaves had negligible health risks. The book concludes that, while those in charge of drug policy are 'unwilling to admit their addiction to...the illusion of control', change is unlikely to come from above unless prohibition becomes financially unviable, but in the US there is already widespread change underway at state or city level, and that whatever drug policy is in place, the problems of compulsive use will not go away until 'nations produce responsible citizens with stakes in conventional society'. That is not in itself a comforting thought, but hopefully this book will help spread the reform message a little further; certainly it's a well researched and informative work for those interested in the subject. The Home Affairs Select Committee is looking into the cocaine trade at present. Transform has sent in a submission and is expected to be called to give evidence later this year. Transform is pleased to announce the launch of our Amazon Associate bookstore. We’ve now assembled a list of some of the best books available about drug policy and drug law reform, which can be found here. All books listed have a link to www.amazon.com where the book is available to purchase. Buy books through our site and you’ll even be helping Transform make some money as we receive a 10% donation of the cost of the book at no extra cost to you. Please send an email to info@tdpf.org.uk to recommend books, or if you’d like to review any of the books listed. Please spread the word and happy reading.